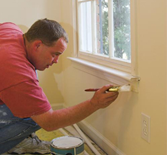 Quality Residential Painting, Inc. provides quality interior painting services to many of the finest homes in the area. We go the extra mile and spend the extra time to get it right the first time. Drawing on more than 32 years of painting experience, our crew is always ready to provide superior service upon request. Making sure to fulfill all your needs in your timeframe, our services are very flexible and we can make just about anything happen. Make the most of your home interior with our interior painting services. We consult with you about the finish you want. We'll never tell you what to put on your walls but make suggestions about the paints and finishes you might like. Contractor-grade paint is never used, only top-of-the-line paint from the brands you prefer. All floors are covered before we begin, and we also offer furniture moving and taking down pictures. If you have special items around the home, we ask that you please secure these items and move them out of the room that will be painted. Make sure your colors match with our color consultation. Drawing on our years in the business, we come to your location to offer expert advice about finding a color choice that is ideal for you. Samples give you a visual idea of what the colors will look like, so we make a sample board. This allows you to envision the paint on the walls before we paint the whole area. We can remove your wallpaper and, in some cases, can apply a new texture. Contact us at (916) 765-8731 in Carmichael, California, to learn more about our interior painting services.